Antibacterial, antimicrobial and soothing. 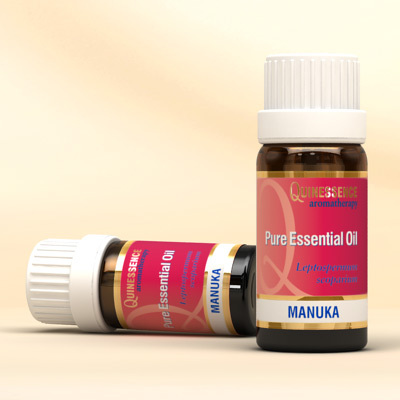 Manuka Essential Oil is a very powerful antibacterial which has been shown in clinical trials to be up to 20 times stronger than tea tree oil on a wide range of Gram-positive bacterium such as Staphylococcus aureus, and MRSA which is now resistant to most antibiotics. It is also equally effective as an antifungal that is particularly effective against ringworm. As well as being more powerful than tea tree oil, Manuka Essential Oil also has a more pleasing herbaceous, honey-like aroma and is less irritating to skin for most people. Used in skin care blends it soothes rashes, spots, acne and irritated skin as well as balancing an oily complexion. One drop placed on insect bites and stings helps soothe and disinfect the area, and speeds healing. The Maori people of New Zealand have used manuka leaves in their traditional medicine for centuries to treat a wide range of ailments including burns, dandruff, dysentery, fevers, skin conditions and rheumatism. Aromatherapists today use Manuka Essential Oil for these conditions and to keep a wide range of bacteria and fungi at bay. Leptospermone, cis-Calamenene, a&b -Copaene, a&b-Selinine, trans-Cadina-1,4diene, d-Cadinene.